You can’t go wrong with a recipe that has the word “fudge” in its name. These cookies are very easy to make and live up to their name. Mmm, fudgy cookies. Yes please. Put 2 1/4 cups of sucanat into a blender. Process until sugar has become powdered. (Here is a post with picture tutorial showing you how easy this is!) In a bowl, mix sucanat powdered sugar with the remaining ingredients. Scoop teaspoon sized balls of batter onto a parchment paper lined cookie sheet (very important). Bake in a 350° oven for 8-10 minutes. Allow the cookies to cool completely while on the cookie sheet. 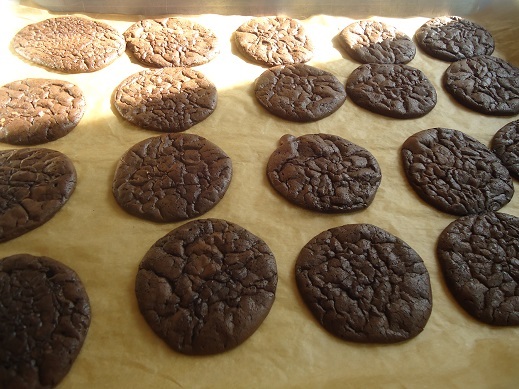 See below, how the cookies sit patiently and cool on their parchment paper so that they will come off the pan nicely? Ah yes, that is the way to do it. These cookies are worth the wait! Have you ever made your own powdered sugar with sucanat? 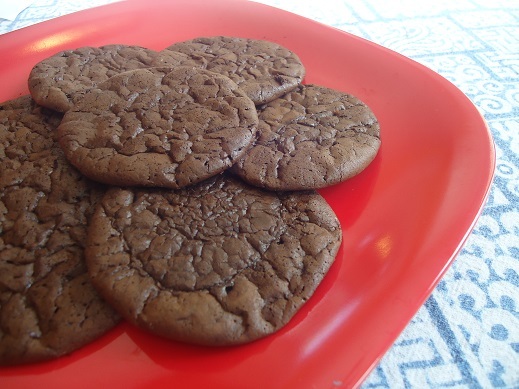 It’s very easy – and these cookies are a great way to experiment with that idea! I am wondering, do you think regular powdered sugar could be substituted? Yes, I think it would work just fine that way. When I saw these I thought of a yummy recipe (with white flour and sugar, of course) for some minty fudge cookies. They are very similar in texture. So, I added 1/2 tsp of peppermint extract in place of the vanilla and made a Flourless Mint Fudge Cookie! They turned out really good and so much easier than my other recipe with 9 ingredients!! Thank you Laura for a healthy alternative and also for the hint about the parchment paper! I am usually scraping cookies too. They’re not exactly healthy (they’re 2/3 sugar!!! ), but it is an easy recipe for an occasional treat… especially if you sandwich vanilla ice cream between them. That’d probablt be the best ice cream sandwich ever! Do you think you could use coconut sugar instead? I don’t use coconut sugar, so I can’t say for sure. I’m not sure what the texture is like? 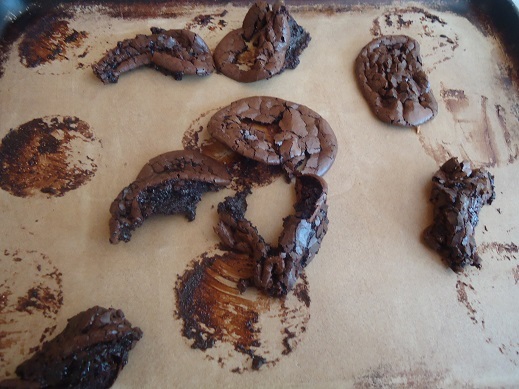 These cookies look delicious….I am questioning the lack of a fat, like butter, before I ‘take the plunge’! Thank you for sharing your family, life and recipes with us. I figured it out. when I put 2 1/4 cups of sucanat into the blender it actually made 4 cups of powdered sugar. I found some other recipes online that used 2 1/4 cups powdered sugar and same ingredients list as here, so I just added the difference of other ingredients. hopefully my mistake will help others! Same here! They ended up looking like little batter balls! I just made these. Halved the recipe just in case I didn’t like them…they’re chocolate, like that could happen, right?! I used Cacao powder and added the equivalent of a 1/2 tsp of instant coffee. I was patient as instructed and I am so pleased. These are in my repertoire now! ps. because of you, my first ever batch of homemade vanilla is in the cupboard steeping…becoming Christmas gifts as I type. Made these for my aunt who can’t have gluten and they were a success! I ended up adding an extra egg white (left over from another cooking endeavor) and added a little bit extra powdered sugar and they actually turned out thicker. 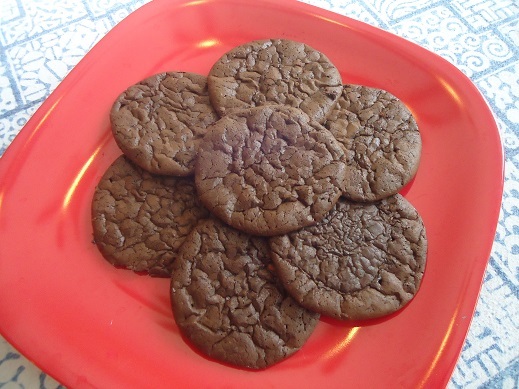 Oh my goodness…my cookies turned out nothing like those pictured. The dough was incredibly dry and formed a big lump in the mixing bowl. The cookies didn’t spread out at all and looked exactly the same coming out of the oven as they did going in. I used powdered sugar (2 1/4 cups) instead of powdered sucanat. I wonder if that made a difference? I think next time I’m going to either add another egg or about two tablespoons of melted butter. Thoughts? I did the exact same thing and had the exact same results. I think it’s the pwdered suger? Maybe it’s too dry? I haven’t tried this recipe yet, but in my experience in powdering your own sugar… if you buy packaged powdered sugar, try sifting it to get the 2 1/4 cups. I haven’t tried them with regular powdered sugar, so I’m not sure. I like the idea of adding an additional egg! Where do you buy sucanat powdered sugar? I have bought it online before, but usually I just make it (click on links in post to show you how). Are you supposed to use 2 1/4 cups sugar turned into powdered sugar (because it makes a lot more than 2 1/4 cups! ), or 2 1/4 cups measured after the sugar is powdered? Two eggs weren’t enough to wet all of the dry ingredients when I measured the sugar before I blended it, but by trying to rectify it, I ended up with a big mess. I baked what I came up with, because I’m sure my boys will eat anything with that much sugar in it, but I’d like to try again knowing that they’re going to turn out right! You should be blending 2 1/4th cups of sugar and using all of it in the recipe. Since it didn’t work out that great I would suggest adding in the blended sugar 1 cup at a time until you end up with all the ingredients being wet. If you have leftover sugar at the end you can use it another time! Hope that helps! These are chewy, chocolaty, and rich enough to eat a couple, but too rich to eat too many. Love it!